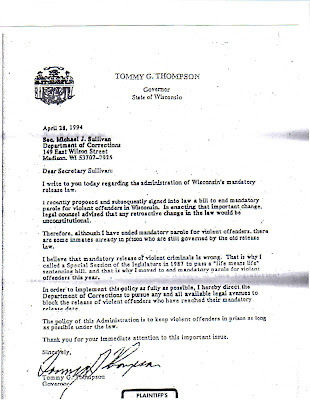 I write to you today regarding the administration of Wisconsin's mandatory release law.I recently proposed and subsequently signed into law a bill to end mandatory parole for violent offenders. 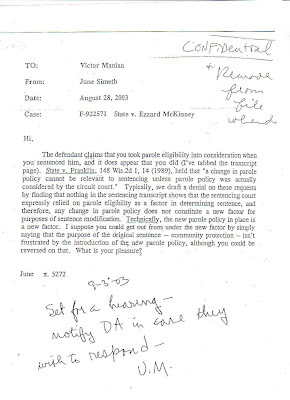 In enacting this important change, legal council advised that any retroactive change in the law would be unconstitutional.Therefore, although I have ended mandatory release for violent offenders, there are some inmates in prison who are still governed by the old release law.I believe that mandatory release of violent criminals is wrong. 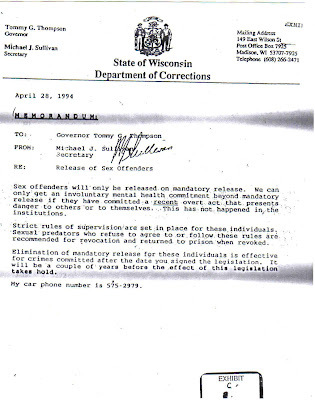 That is why I called a special legislative session of the legislature in 1987 to pass the "life means life" sentencing bill, and that is why I moved to end the mandatory parole for violent offenders this year.In order to implement this policy as fully as possible, I hereby direct the Department of Corrections to pursue any and all available legal avenues to block the release of violent offenders who have reached their mandatory release date.The policy of this Administration is to keep violent offenders in prison as long possible under the law.Thank you for your immediate attention to this important issue.